In eighteen sixty-four the Union of northern states and the Confederacy of southern states were still fighting. The Civil War began in eighteen sixty-one. Each side had its own constitution. Under the Union constitution, Americans were supposed to elect a president every four years. Eighteen sixty-four was such a year. And even though a great civil war was being fought, citizens of the North prepared to choose a leader. This week in our series, Shep O'Neal and Maurice Joyce tell the story of the election of eighteen sixty-four. Abraham Lincoln was completing his first term as president. He hoped to lead the nation for another four years. He wanted to win the war between the states. He wanted to re-build the Union. Lincoln's Republican Party was divided. Moderate Republicans wanted to re-build the Union as soon as the war ended. They believed southern states should be welcomed back with full rights. Radical Republicans disagreed strongly. They demanded severe punishment for the southern rebels. 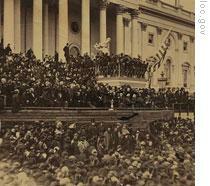 For many months, President Lincoln worked to build a political majority. He formed a new group called the National Union Party. It included moderate Republicans and some Democrats. 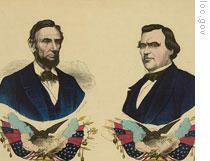 Lincoln succeeded in gaining the support of state and local political leaders. It soon became clear that Lincoln would be the party's presidential candidate in the election. Several hundred radical Republicans held their own convention in Cleveland, Ohio. They formed a new political party called the Radical Democracy. They nominated explorer John Fremont as their candidate for the national election. Fremont had been the Republican presidential candidate eight years earlier. Most of the radical Republicans in Congress did not take part in the convention in Cleveland. They refused to support Fremont. They felt he had no chance to win the election. President Lincoln's new National Union Party held its convention in Baltimore, Maryland. Convention delegates quickly approved a party statement. The statement supported the Union and the war. It opposed slavery. Delegates then were ready to nominate their candidates for president and vice president. On the first ballot, they chose Lincoln to run again. And they chose Democrat Andrew Johnson of Tennessee to run as vice president. During the campaign, Lincoln was advised to begin peace talks with the South. End the war, he was told. Bring southern states back into the Union. Settle the question of slavery later. Lincoln, however, believed his policies were right for the nation. He would not surrender them, even if they meant his defeat in the election. Lincoln hated the war. But he would not end it until military victory ended slavery and guaranteed political union. "For some days past, it seems that this administration probably will not be re-elected. Then it will be my duty to cooperate with the president-elect to save the Union. We must do this between election day and inauguration day. For he will have been elected on such ground that he cannot possibly save the Union afterwards." The Democratic Party held its nominating convention in Chicago, Illinois. Peace Democrats were in firm control. Peace Democrats demanded an immediate end to the Civil War. They did not care if the North and South remained apart permanently. The party's statement contained these words: "After four years of failure to restore the Union by war...justice, humanity, liberty, and the public welfare demand that immediate efforts be made to end the fighting. Let us look to a convention of states -- or other peaceable means -- to restore the Union." The democratic statement did not discuss slavery. It did say, however, that any state wishing to return to the Union could do so without losing any of its constitutional rights. This was believed to include the right to own slaves. Convention delegates approved the statement. 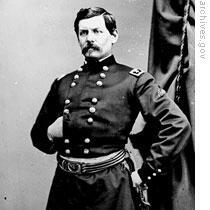 Then they nominated General George McClellan as their candidate for president. Three days after the Democratic Party convention closed, the Union won an important military victory. Union troops captured Atlanta, Georgia. Atlanta was one of the last remaining industrial cities of the South. Its loss seriously hurt the Confederacy. Now the people of the North could understand their side was winning the war. Public opinion began to change. The Peace Democrats lost popular support. President Lincoln and his National Union Party gained popular support. Even some supporters of Radical Republican candidate John Fremont turned to Lincoln. Fremont withdrew from the race. When the people voted in November, their choice was between Abraham Lincoln and George McClellan. A vote for Lincoln meant a vote for continuing the Civil War until it was won. Until the Union was saved. 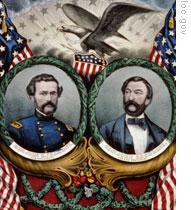 A vote for McClellan meant a vote for stopping the war. Stopping short of victory. By midnight of election day, it was clear that Lincoln had won. He got only about a half-million more popular votes than McClellan. But when electoral votes were counted, he got two hundred twelve to McClellan's twenty-one. Before Lincoln's second inaugural, he agreed to hold peace talks with representatives of the Confederacy. The talks would be held at a Union fort on the Chesapeake Bay. Lincoln was very firm in one demand. The talks, he said, must discuss peace for "our one common country." There could be no talk, he said, of Confederate independence. The Confederate representatives said they could not accept those terms. The peace talks ended in failure. Lincoln returned to Washington. He prepared a message that he wished to send to Congress. It contained a program he felt could end the war within a few weeks. 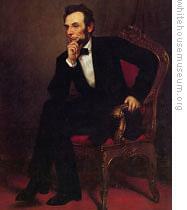 Lincoln proposed four hundred million dollars in economic aid to the southern states. The money could be used to pay slave owners for freeing their slaves. Half the money would be paid if the southern states gave up their struggle by April first. The other half would be paid if they approved -- by July first -- a constitutional amendment ending slavery. As part of the program, Lincoln would pardon all political crimes resulting from the southern rebellion. He also would return all property seized by Union forces. Lincoln's cabinet officers rejected the program. They urged him not to send it to Congress. They said it would be seen as a sign of weakness. Lincoln was surprised by the reaction. He thought his cabinet would gladly end the war...a war that was costing the government three million dollars a day and the lives of the nation's young men. But he accepted the cabinet's advice. He did not send his message to Congress. "On this occasion four years ago, all thoughts were directed to a coming Civil War. All feared it. All tried to prevent it. Both parties opposed war. But one of them would make war rather than let the nation live. And the other would accept war, rather than let it die. And the war came. "We hope -- and we pray -- that this terrible war may pass away quickly. But God may wish it otherwise. He may have it continue until the riches earned from two hundred fifty years of slavery are gone. It may continue until every drop of blood made by the slaveowner's whip is paid for by another made by the soldier's sword. "With malice toward none; with charity for all; with firmness in the right -- as God gives us to see the right -- let us strive on to finish the work we are in. Let us heal the nation's wounds. Let us do all possible to get and keep a just and lasting peace among ourselves and with all nations." "I saw Mr. Lincoln, dressed all in black. He was shaking hands...looking very sad...as if he would give anything to be somewhere else." Our program was written by Frank Beardsley. The narrators were Shep O'Neal and Maurice Joyce. You can find transcripts, MP3s and podcasts of our programs along with historical images at www.unsv.com. You can also follow us on Twitter at VOA Learning English. Join us again next week for THE MAKING OF A NATION -- an American history series in VOA Special English. peace is right and war is going.